All supplies included, all skill levels, daily snack & Friday native cuisine provided. Mixed ages 5 -12 years old. 10% discount for siblings & multiple weeks of camp; discount off 2nd/3rd fee. Mail or drop off only, pre-register w/fee. No discounts online plus $10 fee. $75 deposit until 6/1 per week to secure space. Balance due June 1st for all weeks! Deposits not applicable to early bird discount. Minimum 5 to run a week. Camper behavior: Art Studio reserves the right to dismiss any student for inappropriate behavior. ﻿Contact for the latest space update. What To Draw, PaInt, Weave, Sculpt, Bead, Knead, Glue, Or Paper Mache! problem solving. Plenty of outdoor time and fun in a tree house! Nature, animals, history and art are combined in projects inspired by the rich Mexican culture. Art Studio celebrates the international spirit and the excitement of travel through the visual arts. While creating art campers listen to music from the related destination. At Friday snack party for campers, the local cuisine transports us to exotic places. Each week we visit a country, continent or coast and learn about the regional art, flora and fauna. Indigenous cultures are appreciated and experienced through art and artifacts of distant lands. Campers enjoy interdisciplinary learning that only visual art can provide: geography, science, history, vocabulary, basic art skills, a variety of media, problem solving, music & food. 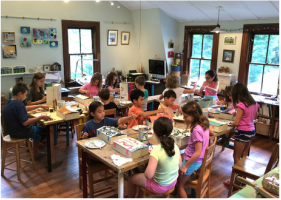 Campers create fun and powerful two and 3-D art projects with plenty of outdoor time. 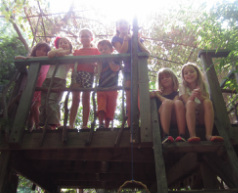 Campers enjoy a wholesome snack in the tree house. We begin each week creating a custom Passport, a fantastic introduction to bookmaking. It serves as a sketchbook for the week. All skill levels & siblings welcome! Click for a registration form to mail or drop off.